So I've been teaching an international finance class, after a long while I might add. The discussion of currency crises models I think is interesting, since it is very revealing of the mainstream assumptions about the long run. Typical discussion would imply that in the long run the Quantity Theory of Money (QTM) and Purchasing Power Parity (PPP) hold. PPP means simply that the exchange rate adjusts for differences between the domestic and foreign price levels. Hence, we have that S =P/P*, where the star indicates foreign variable. If in addition we believe with the QTM that the central bank (CB) controls prices by controlling the money supply, then the CB can control the exchange rate indirectly. In the figure below the 45o line shows the equilibrium levels of the exchange rate (S) as the price level, which is related to the money supply. Now suppose that the central bank fixes the exchange rate at S1 (the graph is based on Dornbusch representation in his classic paper; for now disregard the QQ curve). If the money supply is below the level that corresponds to P1, then the fixed exchange rate is too depreciated for the current stock of money, stimulating exports, discouraging imports, and leading to Current Account (CA) surpluses. In this case, the central bank would accumulate international reserves. The accumulation of reserves leads to increasing money supply and the economy moves to a new equilibrium. In the model above the currency crisis occurs because the CB does not follow a monetary policy consistent with the fundamentals, that is, prints too much money to finance the government. Although, not immediatly obvious the model above is a simplified version of the Mundell-Fleming (MF) model, in the long run, when prices rather than income is the adjusting variable.In this case, the MF model can be represented with the exchange rate and prices, rather than output, as the adjusting variables. The QQ curve is a downward sloping curve, since higher prices increase money demand (or reduce the real money supply), leading to a higher rate of interest and a more appreciated exchange rate (lower S). Note the QQ curve is just the old LM for an open economy. Dornbusch's trick, which was considered the first New Keynesian model (featuring both rational expectations and price rigidities), is that the nominal exchange rates adjusts faster than prices, then an increase in money supply would shift the QQ (LM) curve upwards. An increase in money supply reduces the domestic interest rate, leading to a depreciation of the currency. The economy moves from point A to point B. Then as depreciation increases net exports, and a lower rate of interest leads to more investment, there will be excess demand in the goods market, and for an economy that is at full employment, prices would go up. 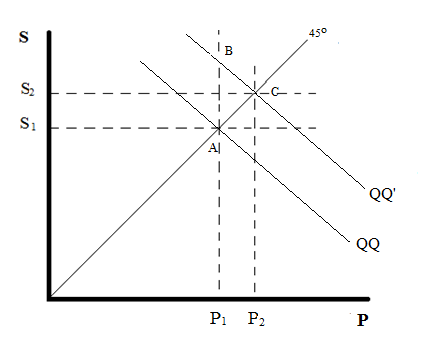 As prices go up, then the economy moves down the new QQ’ curve from point B to C, since with higher prices money demand increases and the rate of interest must increase (less than the initial decrease) causing some appreciation (less than the initial depreciation). At the new equilibrium the exchange rate is more depreciated than at the original equilibrium, but because of the short run rigidity of prices, the exchange rate overshoots its equilibrium value in the short-run. The point was that even if markets were efficient, in the sense that with price flexibility they tend to full employment and to the equilibrium exchange rate (PPP), the use of the exchange rate to deal with shocks might lead to excessive volatility. There are many problems with the long run MF model (meaning the one solved in the S-P space). The obvious one is the notion that price flexibility leads to full employment, something that Keynes long ago suggested was NOT the case. Although Keynes was aware of the possibility of the system returning to full employment with price flexibility, he suggested that if lower prices had a negative impact on firms that are indebted, then investment would fall. In his own words: "indeed if the fall of wages and prices goes far, the embarrassment of those entrepreneurs who are heavily indebted may soon reach the point of insolvency, — with severely adverse effects on investment." In other words, with price flexibility the IS shifts back, and there is no tendency to full employment. That means that one should stick with the solution of the model in S-Y space, if one wants to introduce the open economy (one such model, without full employment and many other mainstream characteristics is available here). Alternative (classical-Keynesian, post-Keynesian or whatever you prefer to call them) models would not only emphasize the role of quantity adjustments, but also the the sustainability of the current account (CA), rather than fiscal deficits in the explanation of currency crises. While conventional currency crises models of all generations (including the more heterogeneous 3rd generation models) suggest that at the heart of currency crisis there is a fiscal crisis, post-Keynesians emphasize terms of trade shocks and hikes to foreign rates of interest, highlighting the role of the balance of payments constraint in currency crises. Note that the economy in this view is not at full employment, and, hence the effect of fiscal expansions is not on prices, but on the level of activity. Higher level of income leads to increasing imports and a deteriorating CA. It’s the deteriorating CA and not the fiscal deficits that matter and the CA position might worsen even if the fiscal accounts are balanced. Further, after a currency crisis the central bank hikes the rate of interest, increasing the costs of debt-servicing, and, hence, government spending, at the same time that the recession reduces the revenue, leading to a weakening of the fiscal accounts. In this case, it is the external currency crisis that causes the domestic fiscal crisis. Causality is reversed. My two cents. * Later models, like Obstfeld's, shown that if the costs of defending the parity are high, for example because in order to preclude the loss of reserves associated with a currency attack, the central bank hikes the rate of interest and pushes the economy into a recession, then there is a chance that self-fulfilling speculation might lead to a crisis. ** The IS curve would be positively sloped and steeper than a 45o line, since depreciation creates excess demand in the goods market. To restore equilibrium, domestic prices would have to increase, though proportionately less, since an increase in domestic prices affects aggregate demand, both via the relative price effect and via higher interest rates. PS: I had posted before on my course here, were there is a link to Serrano and Summa's critique of the MF model. What utter nonsense --as the fact following the Fed's policy clearly demonstrate there was no massive inflation.. Exactly Paul. It presume all of the things you (and Keynes) always criticized, from full employment to money neutrality. The funny thing is that Krugman and Dornbusch are the New 'Keynesians' within the mainstream.